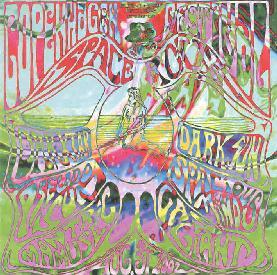 Various Artists - "Copenhagen Space Rock Festival Compilation 2002"
Dark Sun get two tracks, "Electrified" and "The Epic World Of Captain Gizmo". They're an excellent mixture of cosmic Space Rock and electro-dance elements with Nik Turner guesting on sax. It's different than the music heard on their Feed Your Mind album but great songs, which only makes the wait for a new full length from these guys all the more painstaking. Visit Dark Sun at http://hop.to/darksun. "Warriors/Abberant Station" by DarXtar is a special entry because it's a live track from the mid-90's when Juba Nurmenniemi (now in Pseudo Sun) was still with the band. It's a terrific slab of heavy driving totally spaced out SPACE ROCK. At 9+ minutes it includes the song and an extended instrumental section. Just fantastic. What's interesting is that while it plays as a single track, the intro section ("Warriors") was actually recorded live in � while the main song ("Abberant Station") was recorded in �. Visit DarXtar at http://welcome.to/darxtar. I think we've published more live reviews (all by Scott) of Gas Giant than any other band. Well it only takes one listen to this 16 minute Stoner-psych trip to understand Scott's enthusiasm for this Danish band. The song is called "Deep Space Flight with Jim on Board" and starts off hard, heavy, and completely spaced with a brain pounding heavy rocking rhythm section and guitar licks that are Space Ritual redux. If you dig Stoner Rock but you're tired of the standard Black Sabbath influenced sludge and are pining away for the heaviest and most acidic of influences in the genre... then you need look no further. Gas Giant will blow your mind. These guys just JAAAAAAAM and SPAAAAAAAAAAACE!!! Visit Gas Giant at http://www.gasgiant.dk. Danish band Mantric Muse is the one entry that many people probably won't be familiar with. That's because they're only now wrapping up their first CD. "Cinope" is a mightily impressive Space-Prog instrumental that combines elements of tripped out Meddle era Pink Floyd and complex but totally spaced out progressive rock. My prediction is that these guys are going to seriously blow some minds when they do come out with an official release. Visit Mantric Muse at http://www.mantricmuse.dk. Ultra heavy space rockers Pseudo Sun also managed to get two tracks. "Shapeshifter" is a live version of the song that appears on their recent Atomic Dogs Don't Bark CD. It's excellent brain smashing Space Rock with Nik on sax. You get the song and the extended instrumental jam... what more could you want? And "Woodland Waterfall" is a very cool Bluesy instrumental acid-psych rock workout. Gorgeously raw and jamming stuff. Visit Pseudo Sun at http://www.warp9.to/pseudosun. Finally, if you've heard even a little music from The Spacious Mind then you'll know that they create some of the most brain massaging space-psychedelia of any band in the world. Their entry is a 12 minute instrumental called "Floatin' Down The River Whistlin' On A Tune". The track begins with an ambient acid-space intro that gradually builds in cosmic power and intensity until it reaches the slow but commanding pace that characterizes the bulk of the tune. These guys really know how to build tension and the early 70's psych-fusion elements keep things rolling along at a slow but hypnotically steady pace. Not among the bands best work, but it's still a solid jam that will conjure up all sorts of fun images as you lay back and gaze up at the clouds. The Spacious Mind don't seem to have a web site these days but you can email them at spacious_mind@hotmail.com. An excellent set that you simply can't go wrong with. HIGHEST Recommendation! For more information you can visit the Burnt Hippie Records web site at: http://www.burnthippie.dk.